Over the past decade, there has been an increasing evidence of false-positive FDG uptake in several infectious diseases and aseptic inflammatory processes. 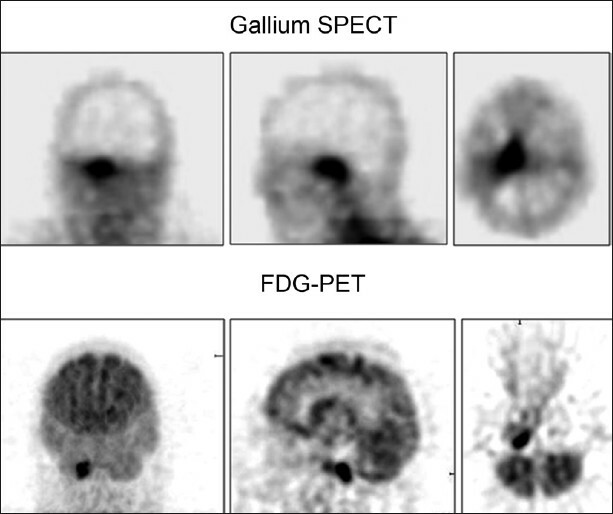 With the widespread application of FDG-PET imaging in oncology, the interpreting physicians have come across these conditions frequently leading to false-positive diagnosis. 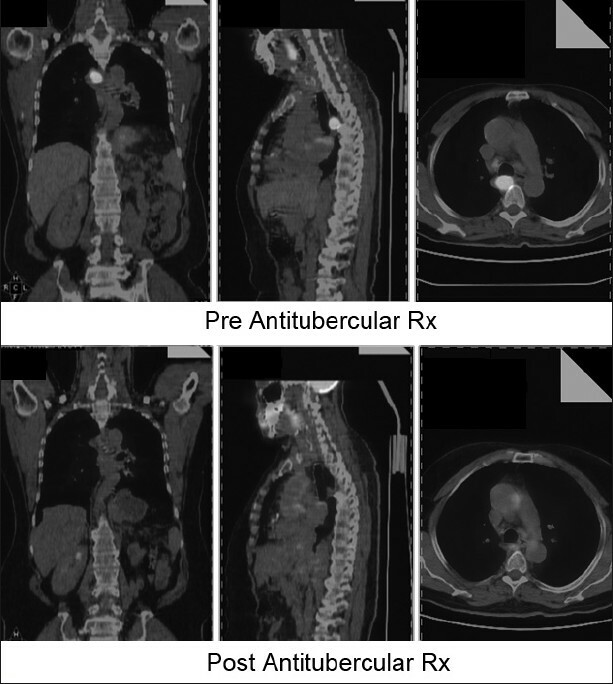 Such conditions can coexist with metastatic lesions in patients with cancer, and hence, early and accurate diagnosis or exclusion of infection and inflammation is of utmost importance for the optimal management of these patients. Also, this powerful imaging modality can play an invaluable role for the appropriate management of these complicated benign conditions. The present communication on this non-oncological application of FDG is intended as an educative primer for practicing oncologists on this very important aspect of PET-CT imaging with an ultimate aim for bettering patient management. From serendipitous observations made as the source of non-specific FDG accumulation in the context of malignancies, recent years have witnessed rapid strides in the potential applications of FDG-PET in several infectious diseases and aseptic inflammatory processes, and the literature on this issue is rapidly evolving. ,,,, Concerns have been raised, at the same time, with regard to the specificity of this high resolution molecular imaging technique in patients with cancer where such false positives can lead to serious consequences. 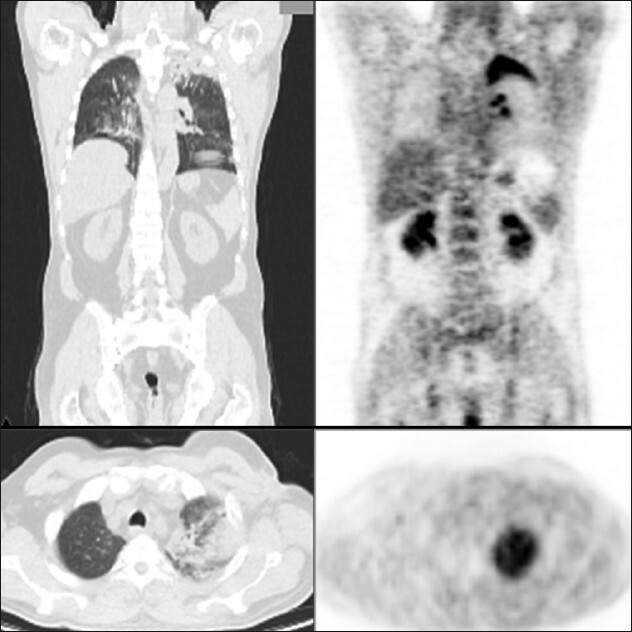 Hence, it is imperative, both from the perspectives of the interpreting nuclear medicine physician as well as the oncologists, to appreciate the PET findings in these conditions, the realization of which is of great importance for the optimal management and decision making in these patients. The treatise, thus, is presented in the form of a pictorial review with case vignettes upholding the varying etiopathologies responsible for the FDG uptake. While several molecular mechanisms have been proposed as the basis for FDG uptake in the inflammatory cells, overexpression of GLUT-1 subtype in the stimulated macrophages, neutrophils, and lymphocytes is considered the most likely underlying biological phenomenon responsible for this observation. The activated inflammatory cells accumulate FDG with high concentration depending upon the degree of stimulation that is a function of inflammatory activity at the respective site. Sarcoidosis is a multisystem granulomatous inflammatory disease characterized by non-caseating granulomas. FDG uptake based upon disease activity is observed, which can be of substantial benefit in monitoring treatment efficacy. Assessment of disease activity in patients with sarcoidosis is critical to determine whether corticosteroid therapy is efficacious and whether the dose of the drug should be modified. 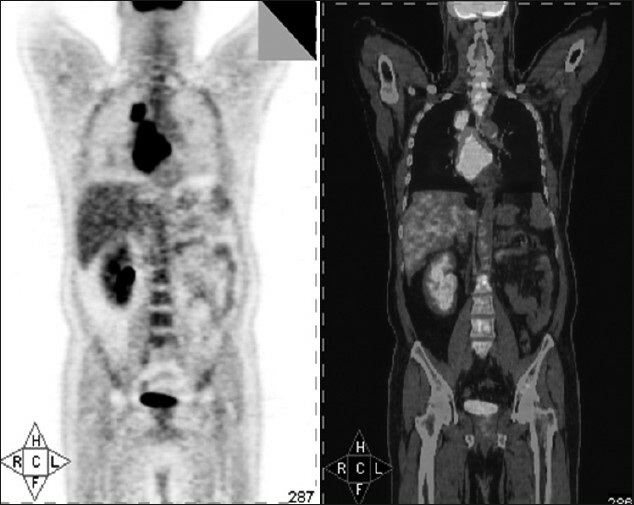 FDG-PET [Figure 1]: [upper panel] showed multiple abnormal foci of FDG uptake in the both sided neck nodes, mediastinal and axillary nodes, liver, spleen, thyroid and multiple abdominal (paraaortic and inguinal nodes). The biopsy of the inguinal nodes was confirmatory of sarcoidosis. He had a history of hypothyroidism, which is frequently associated in this disorder and is predicted to be due to association of autoimmunity that is very important in the pathogenesis of thyroid disease in this population. The patient was prescribed oral corticosteroid and was referred for reassessment of disease status following 6 weeks of initiation of therapy. The FDG-PET this time [Figure 1]: [lower panel] showed remarkable improvement of the disease status with near total resolution FDG hypermetabolism at the involved sites. By now, it is evident that tuberculous lesion can demonstrate variable FDG uptake determined by the inflammatory activity. FDG concentrating bilateral hilar and mediastinal foci associated with this diaease have been a source of concern in the current PET practice in oncological setting benign or malignant pathologies draws attention of the readers to a very important and practically relevant issue of current PET practice in oncological setting. This has a geographical relevance and is of major concern in the Asian countries including India, where tuberculosis has a high prevalence, and hence, the need for educating the physicians who are actively involved in the interpretation of PET images to obviate errors in this confounding situation can hardly be overemphasized [Figure 3], [Figure 4], [Figure 5]. Several studies and reports have documented avid FDG uptake in osteomyelitis and the important role of FDG-PET in diagnosing patients with chronic osteomyelitis. It is expected that FDG-PET imaging will be used routinely in the near future to determine the presence or absence of an infectious focus, to monitor response to antimicrobial treatment, and to develop certain criteria for deciding when the treatment can be safely stopped [Figure 6], [Figure 7]. Fever of unknown origin (FUO) is a clinical challenge especially in the elderly and may become an accepted indication for 18 F-FDG-PET in clinical practice. The nonspecificity of FDG is of great value in evaluating patients with FUO because it accumulates in infections, malignancies, and inflammatory diseases, which are the three major etiopathologies of FUO [Figure 8], [Figure 9], [Figure 10], [Figure 11], [Figure 12], [Figure 13], [Figure 14]. Figure 9: Avid FDG uptake in the focus of infection in a patient of proven malignant otitis externa (Reproduced with permission from Elsevier Inc. for Zhuang et al.). 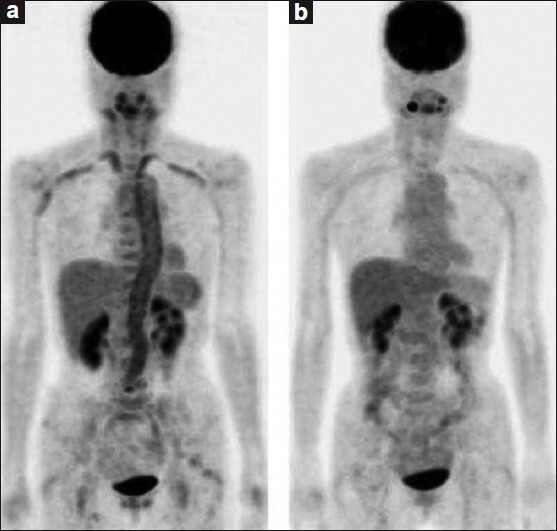 Figure 10: Patient of HD underwent for PET-CT for staging. Axial sections of CT, PET, and PET-CT showed increased FDG uptake in multiple right cervical lymph nodes. 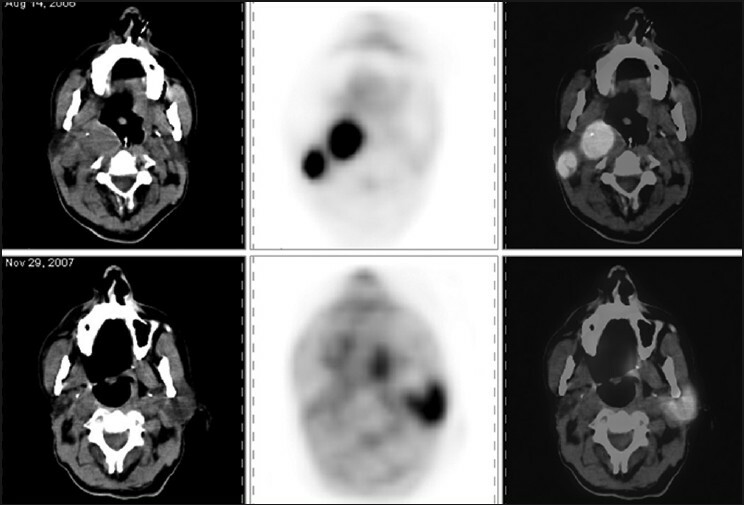 Follow-up PET-CT scan showed resolution of primary lesions, however diffuse increased FDG uptake was noted in contralateral parotid gland. FNAC of the same confirmed the diagnosis of parotitis. The differentiation between infection and prosthetic loosening without infection is a major challenge for orthopedic surgeons. While prosthesis revision is often successful and is not associated with major complications for aseptic loosening alone, the presence of superimposed infection requires intensive treatment before surgical revision is undertaken. Abnormal FDG uptake along the bone prosthesis interface in the middle portion of the shaft of the prosthesis is the most reliable indicator of periprosthetic infection as it is well known that nonspecific FDG accumulation may be present around head and neck portion of the prosthesis for several months (and possibly years) after surgery [Figure 15], [Figure 16], [Figure 17]. Figure 17: Shown is a 43-year-old man with a history of tibia-fibula fracture requiring external fixator. 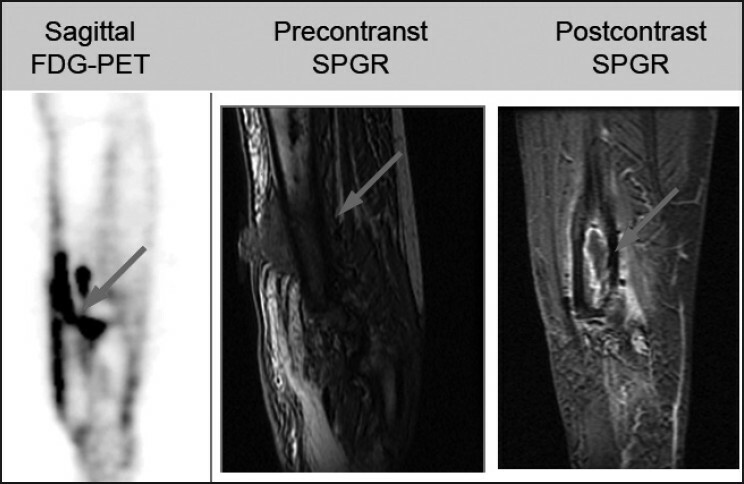 Coronal PET images demonstrate intensively increased FDG uptake in the distal tibial region that extends to the skin, representing a fistula tract. Surgical and histopathological examinations confirmed osteomyelitis. (Reproduced with permission from Elsevier Inc. for Basu et al.). FDG-PET is a valuable tool in the evaluation of possible infection of vascular grafts. 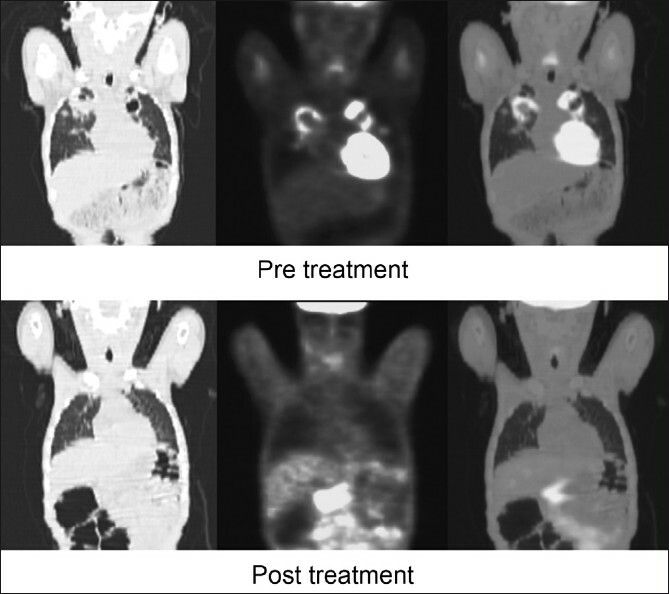 FDG-PET is able to detect vascular graft infection even when CT results are negative. This early diagnosis can aid in rapid surgical intervention with graft removal and required bypass. Based upon the initial encouraging results, larger controlled studies have been undertaken to evaluate the utility of FDG-PET in the diagnosis of prosthetic aortic graft infection [Figure 18]. 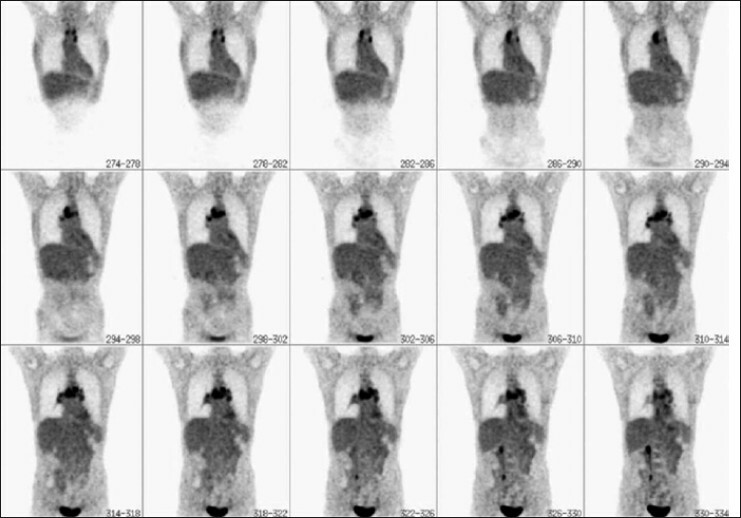 FDG-PET has the potential to be added to the imaging armamentarium as a functional technique for scanning and detection of metabolically active processes along large- and medium-sized arteries. It has been reported to be useful in the diagnosis and treatment of patients with vasculitis by several investigators. FDG-PET/CT has also been considered by several authorities to hold great promise for assessing atherosclerosis in large arteries. Vascular FDG uptake also has been linked to cardiovascular events by several reports [Figure 19], [Figure 20]. FDG-PET provides an objective means to noninvasively assess the severity of bowel inflammation in IBD, and hence, can be valuable in guiding therapy in inflammatory bowel disease by depicting inflammation in the whole bowel with high sensitivity and accuracy in a single examination [Figure 21]. 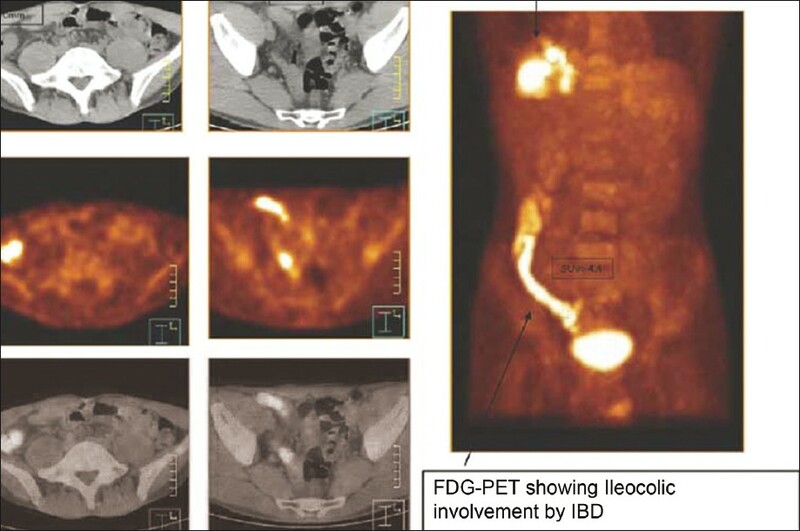 Figure 21: FDG-PET/CT images show significant uptake in the distal ileum, which extends to the cecal region, which is mildly active (long arrow), clearly demonstrating the high sensitivity of this technique for detection of regional inflammation. 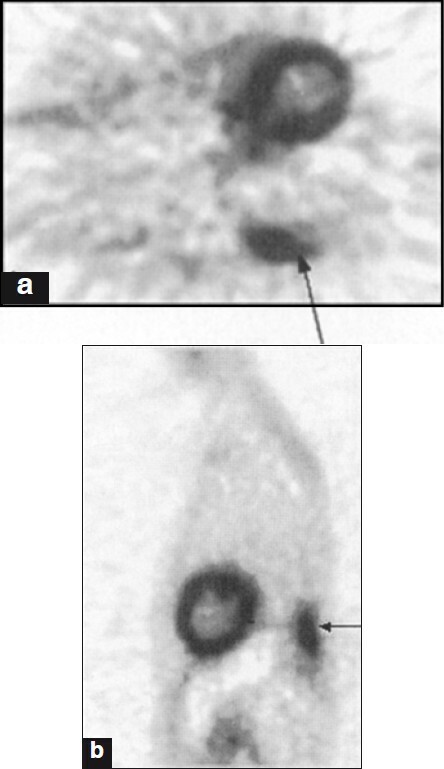 Interestingly, there is serendipitous finding of FDG-avid right lower lobe bronchopneumonia (short arrow), which became symptomatic the day after the PET/CT study was acquired (Reproduced from Basu et al. with permission from Elsevier Inc.). 1. Basu S, Asopa RV, Baghel NS. Early documentation of therapeutic response at 6 weeks following corticosteroid therapy in extensive sarcoidosis: Promise of FDG-PET. Clin Nucl Med 2009;34:689-90. 2. Yu JQ, Zhuang H, Mavi A, Alavi A. Evaluating the role of flurodeoxyglucose PET imaging in the management of patients with sarcoidosis. PET Clin 2006;1:141-52. 3. Kumar R, Basu S, Torigian D, Anand V, Zhuang H, Alavi A. 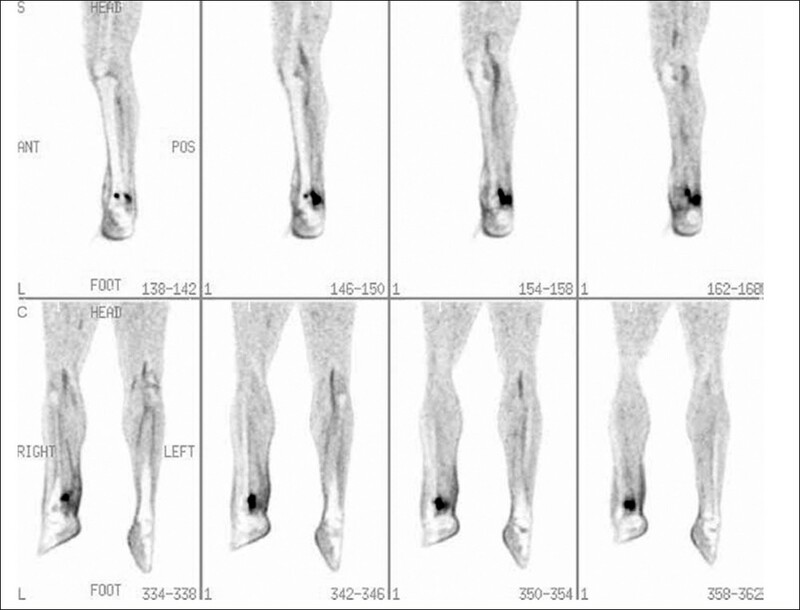 Role of modern imaging techniques for diagnosis of infection in the era of 18 F-fluorodeoxyglucose positron emission tomography. Clin Microbiol Rev 2008;21:209-24. 4. Zhuang H, Alavi A. 18-fluorodeoxyglucose positron emission tomographic imaging in the detection and monitoring of infection and inflammation. Semin Nucl Med 2002;32:47-59. 5. 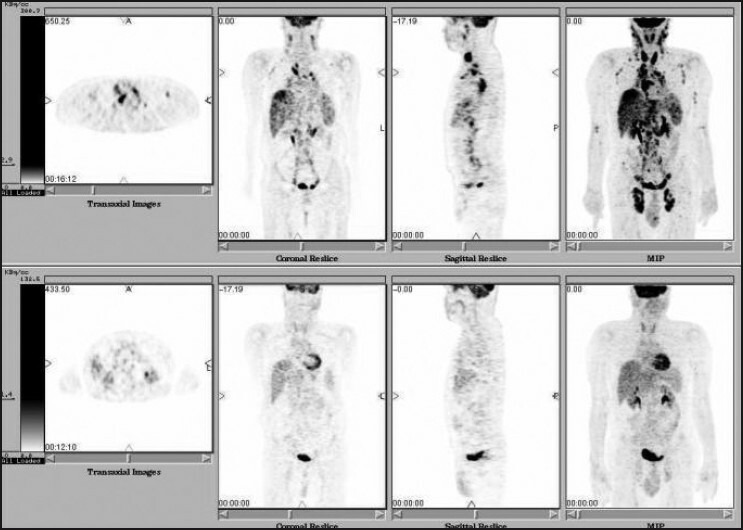 Basu S, Chryssikos T, Moghadam-Kia S, Zhuang H, Torigian DA, Alavi A. Positron emission tomography as a diagnostic tool in infection: Present role and future possibilities. Semin Nucl Med 2009;39:36-51. 6. Alavi A, Gupta N, Alberini JL, Hickeson M, Adam LE, Bhargava P, et al. 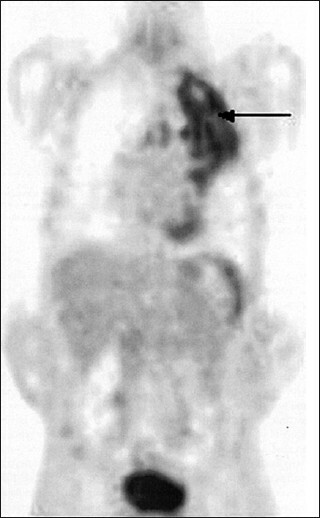 Positron emission tomography imaging in nonmalignant thoracic disorders. Semin Nucl Med 2002;32:293-321. 7. Krupnick AS, Lombardi JV, Engels FH, Kreisel D, Zhuang H, Alavi A, et al. 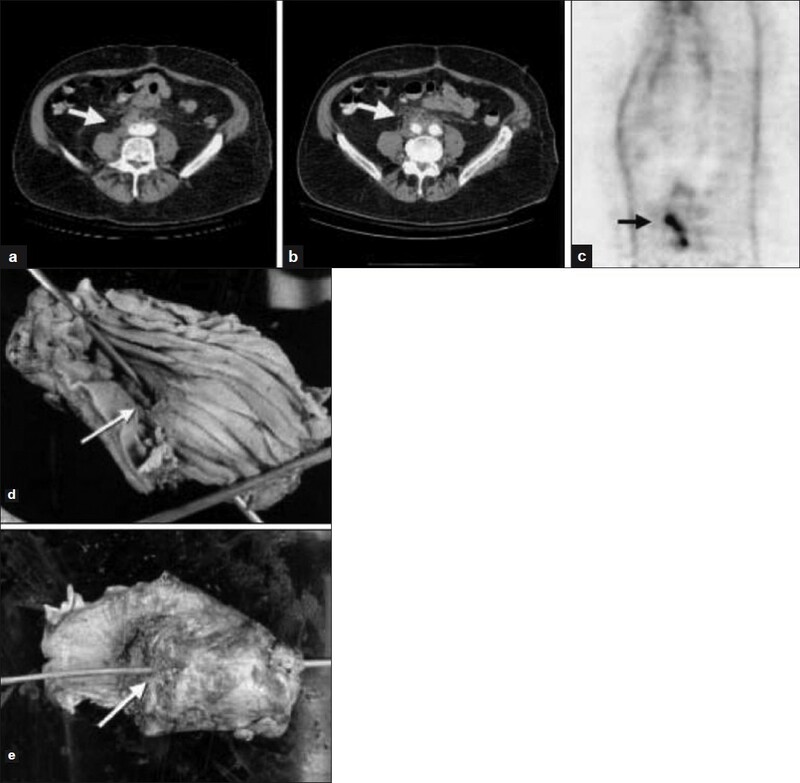 18-fluorodeoxyglucose positron emission tomography as a novel imaging tool for the diagnosis of aortoenteric fistula and aortic graft infection: A case report. Vasc Endovascular Surg 2003;37:363-6. 8. 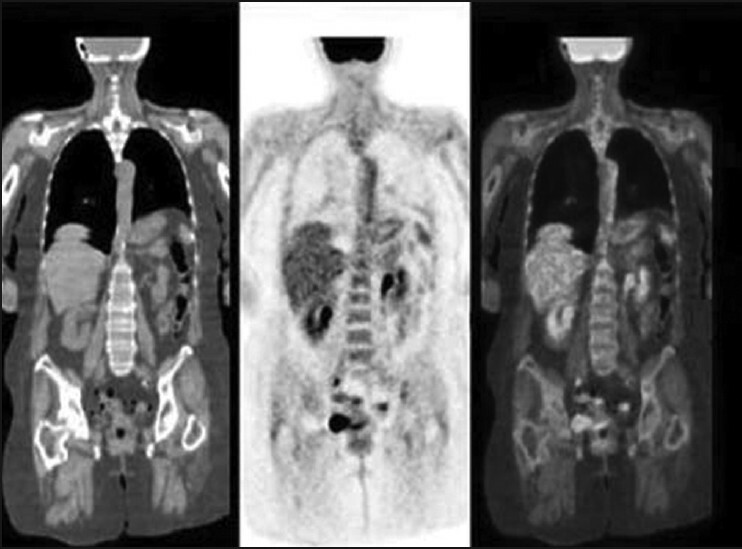 Otsuka H, Morita N, Yamashita K, Nishitani H. FDG-PET/CT for diagnosis and follow-up of vasculitis. J Med Invest 2007;54:345-9. 9. 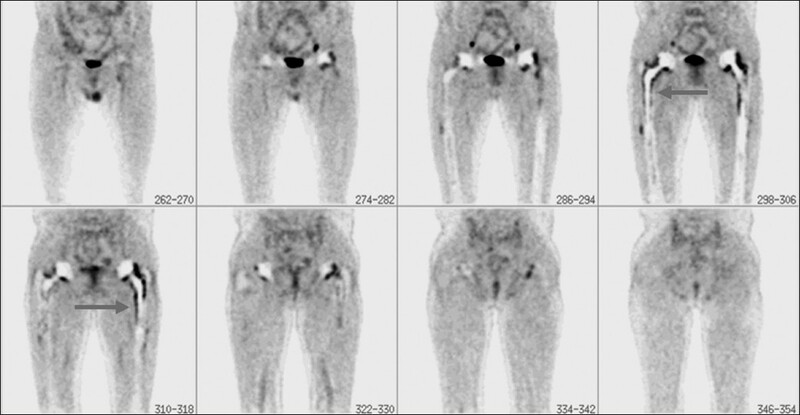 Basu S, Zhuang H, Torigian DA, Rosenbaum J, Chen W, Alavi A. Functional imaging of inflammatory diseases using nuclear medicine techniques. Semin Nucl Med 2009;39:124-45. 10. Basu S, Torigian D, Alavi A. The role of modern molecular imaging techniques in gastroenterology. Gastroenterology 2008;135:1055-61. Nijkamp, J. and Rossi, M. and Lebesque, J. and Belderbos, J. and Van Den Heuvel, M. and Kwint, M. and Uyterlinde, W. and Vogel, W. and Sonke, J.-J. Nijkamp, J., Rossi, M., Lebesque, J., (...), Vogel, W., Sonke, J.-J. Lotz, J.C. and Haughton, V. and Boden, S.D. and An, H.S. and Kang, J.D. and Masuda, K. and Freemont, A. and Berven, S. and Sengupta, D.K. and Tanenbaum, L. and Maurer, P. and Ranganathan, A. and Alavi, A. and Marinelli, N.L. Patel, V., Papineni, R.V.L., Gupta, S., Stoyanova, R., Ahmed, M.M. Curiel, R., Akin, E.A., Beaulieu, G., Depalma, L., Hashefi, M.
Mortazavi-Jehanno, N. and Jidar, K. and Ben Ali, K. and Rioux, C. and Burg, S. and Poisson, T. and Joly, V. and Le Guludec, D. and Yeni, P. and Sarda-Mantel, L.